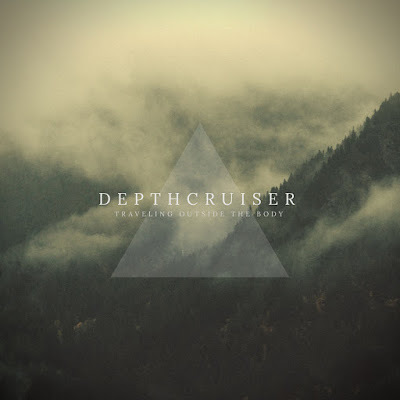 The long awaited LP release from DepthCruiser has finally arrived. Traveling Outside The Body is an incredibly atmospheric and complex collection of compositions, the likes of which range from the deeply thoughtful and provocative, to the ultimately calming and consciously soothing. Aural Colonization, the opener, offers up the perfect meeting of all of this, and it’s a hugely powerful way to begin. The soundscape itself is massive and minimal, spacious and distant feeling, which, combined with the ideas put forth by the delicate spoken word element, makes for something that immediately pulls you into the centre of the experience. Dimensional Dreams follows on in a lightly peaceful sort of way. As is the DepthCruiser approach, the music takes every moment as an opportunity to explore and express. Nothing is rushed, the ambiance emerges gradually, as if following you along as you venture cautiously out into the quiet unknown. Later on, the beat hits almost unknowingly – carefully woven into the mix in a hypnotic and beautiful way; a sign of the master producer at work. Presence Behind The Illusion keeps the thread of the experience running strong. The familiar leading voice continues to explore these ideas and stories, the latter of these options being the more prominent in this case. The music has a slightly higher energy now, a quicker pace – the imagery and scene set by the language use fits in with this sense of movement brilliantly. Following this, Miles Above Ordinary presents a different kind of mood. A touch of warped or distorted synth riffs bring the music into new realms of enjoyment. There’s a softly chaotic sense of colour to it all, and as the track progresses, the music really absorbs all of your outer concerns in a deeply therapeutic manner. The detail and indeed the overall experience increases in intensity, just subtly, and it makes for a mesmerising and quite addictive few minutes of audio. The story telling reaches an all time high with Endless Woods – the contrast between the natural imagery of the lyrics and the soft crackle of the soundscape is captivating. The inclusion of you, the self, the listener, within the lyrics, invites a whole new experience into the mix. As stated in the previous review of this artist, the music feels like ASMR in many ways. It makes for the perfect source of escapism or the perfect accompaniment for meditation. This LP in its entirety washes the trivial issues of your world away for a while, just as music should, though in this case it feels like something much more than just music. The Reality Of Your Existence is a title that provokes the perfect kind of consideration to fit in with the mood and moments explored by the music. As you find yourself alone with your own thoughts and these emerging, all encompassing soundscapes, you ponder just about everything there is or isn’t, and it’s not terrifying – it’s strangely calming to consider and accept the possibilities in this setting. This track evolves into a fairly vibrant and uplifting piece of music. The project comes to a close with the aptly named title track, confirming all that has come to pass, allowing you one final ride through the outer realms of existence – outside of yourself. You can come back to this album again and again, the effect is intense and peaceful at the very same time. The detail and artistry of it is something to admire, yet the overall gift it gives to its audience is something to be incredibly grateful for. DepthCruiser has an absolute ability to create and craft these entrancing, revealing experiences through audio. Not to be missed.